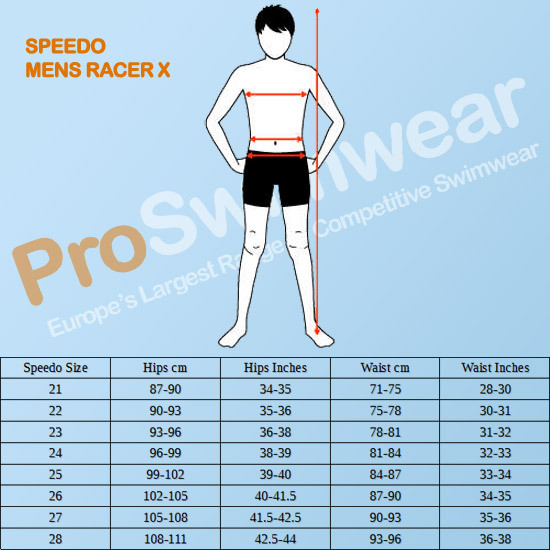 The FINA approved Speedo LZR Racer X Jammers are the latest performance racing suits. Feel the Water. Feel the Speed. Feel Fast! with the Racer X Jammers, as Worn by Florent Manaudou 50m Free World Champion. Created from hours of research and development with direct input from some of the world's top swimmers. the Speedo LZR Racer X delivers speed and performance in the pool when you need it most! Reach your maximum potential with the Speedo LZR Racer X. The Speedo Fastskin mission is to provide the world's top competitive swimmers with the widest and best choice of swimwear and swimming equipment designed for optimum speed and performance in the water. The FastSkin range has been developed to create a racing system that works in conjunction with your body shape to meet your personal swimwear and equipment preferences. Extensive research carried out with 3D scanning technology allows Speedo to bring you increased compression, maximum comfort and improved proprioceptive sensitivity as well as reduced drag and a precise fit. Over 10,000 hours have been spent on product development to bring you Speedo's fastest and best fitting racing swimsuit yet! Incorporates a new unique stretch fabric on the legs and glutes. providing high levels of compression. The LZR CompreX material used in the Speedo LZR Racer X utilizes one-way stretch technology. Allowing full freedom of movement during all swim strokes. Comfortable and supportive fit helps you to maintain a highly streamlined profile during your race. Maximised Support Seam Construction. Various seams and panels on the suit work together to promote correct body position for streamlined, efficient swimming. The 'finishes' (The areas around the waist and leg openings) have been improved since the last generation of Speedo Tech Suits for a better fit and easier entry into the suit without fear of damaging the swimwear. The unique tape design shimmers with multiple colours in the light and will make you stand-out as a serious competitor on the blocks! Mircrofibre and silicone strips guarantee a soft yet secure waistband and the anti-friction drawstring offers even tension and remains secure. The regular waist jammers offer greater flexibility and may be preferred by breast stoke and IM swimmers. Waist height usually comes down to personal preference.